A 20th Century bar favorite, the Moscow mule is classically made with a vodka, ginger beer for a bit of spice, and lime juice for an acid tang. 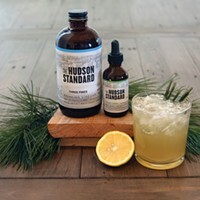 The Hudson Standard, a Hudson Valley-based company, specializes in artisan, small-batch shrubs and bitters made with locally grown and foraged ingredients. Their cocktail recipes offer a twist on timeless drinks made with regionally appropriate flavors. In their variation on a Moscow mule, the Hudson Standard uses a blend of liqueur and bitters to achieve the ginger flavor. Their turmeric switchel, made with cayenne, peppercorn, honey, ginger, and apple cider vinegar, adds a bit of kick to this cold cocktail (while boosting your immune system and warming your insides). Combine vodka, Spicy Turmeric Switchel, lime juice, ginger liqueur and ginger bitters in an ice-filled shaker, shake well and pour into ice-filled copper Moscow Mule mug. Top with seltzer and lime slice, stir with straw and enjoy!